New York : Harcourt Brace and Co., c1995. 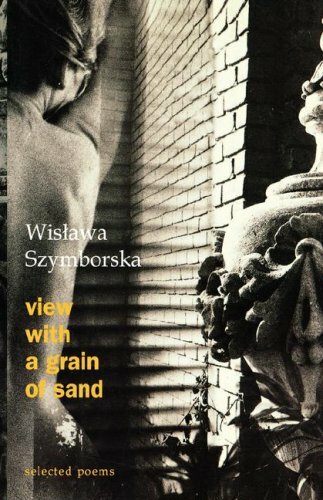 An anthology by a Polish writer. In Bodybuilders' Contest, she writes: "He grunts while showing his poses and paces. / His back alone has twenty different faces. / The mammoth fist he raises as he wins / is tribute to the force of vitamins." By the author of Sounds, Feelings, Thoughts. Krakow-born Wislawa Symborska won the Nobel Prize for Literature in 1996. She survived WWII in Poland, and the long Russian occupation after that. Yet her calm, probing voice is not filled with anger, or self-pity. Sometimes taking on a different persona, she eloquently invites us to see the surface we often take for granted and look beneath it for greater meaning. This can take the form of revealing moments in our daily lives, some as seemingly mundane as stripping for the doctor, some as elusive as the significance of love. But what she has gone through provides the propulsion. I don't know the games of the heart. I've never seen my children's father. that hides behind the Song of Songs. What I want to say comes in ready-made phrases. only given to me for safekeeping. I'll pass you by on the chasm's edge, finer than a hair. behind which life goes unpainted. fake a little depression for their friends' sake! Listen to them laughing - it's an insult. if people started to follow their example. keep saying there's no such thing. Conversely, she writes a humorous "Thank-you note" to those she doesn't love: "I owe so much/ to those I don't love." They're so much easier to live with. The title poem, "View with a Grain of Sand", is about how meaningless we are to the non-human world around us, despite our belief in our importance, and how our naming means nothing to the named. She is often very funny and self-deprecating, like when she compares a small turnout at one of her readings ("Half come inside because it started to rain./The rest are relatives. O Muse.") to the packed attendance at a boxing match. Szymborska writes beautiful, accessible poetry. This collection includes 100 poems sampled from seven works, from Calling Out To Yeti (1957) through The End and The Beginning (1993), a time period spanning the Cold War in Poland as a Soviet satellite, the Solidarity movement, and the fall of communism. Szymborska was 34 when the first set was published and 70 at the end of the collection; she continued writing until her death in 2012, picking up a well-deserved Nobel Prize in Literature along the way. Constant throughout her life and work was her sense of wonder, her playful use of words, and her simple way of touching on the deepest truths about love, life, and the world. She often took everyday events or observations, and through them communicated timeless profundity. She is truly a joy to read. This volume is filled with gems. She addresses a very broad range of themes in these poems --– the folly of reductionism, randomness and contingency in human experience, the propensity to cruelty and injustice and virtually every modern irony you can think of. She uses simple, sure rhythms, and deliciously quirky, smart, playful and ironic imagery. The tone of these poems is consistent, but hard to describe -- passionately detached? Exuberantly ambivalent? Naively sophisticated? The power of these poems is not so much the novelty of the ideas she expresses, but her ability to make us see and appreciate the wonderful ironies of common experience anew. Perhaps that’s the definition of the poet’s calling. Szymborska won the Nobel Prize for Literature, and with good reason. These are beautiful poems, sometimes cold and epic-feeling, but more often small, warm, and true. Any fault I find with these poems I ascribe to the vagaries of translation. I wish I could read these in the original Polish. Whatever pale echoes these might be, they are yet powerful and true. "This terrifying world is not devoid of charms..."
My recent bouts with verse have been belabored, not in terms of complexity or allusion but because, so often, the stanzas were heavy. The weight of history and personal affectation gave each phrase a heft. Imagine how disoriented I was when encountering Szymborska. This collection nearly bursts with a wild-eyed wonder. There is a freshness to almost every observation. There is a youthful lightness which appears to almost float from one stanza to the next. It shouldn't be assumed then that this collection is childish, not without first accepting a subtle weary edge. My favorite line is "My faith is strong, blind and without foundation." That disconnect creates an opening, a fissure of sighs where wonder goes to molt.